Our career tracks are hand-picked by industry experts. 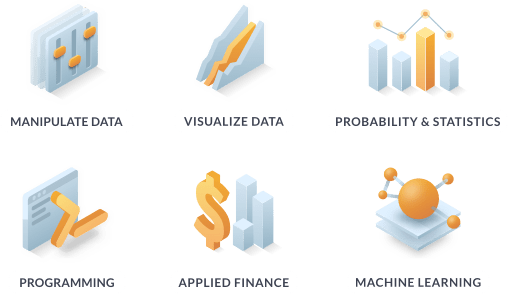 You will learn all you need to start a new career in the data science field. Commonly used for putting models "in production"
An R Developer uses their programming skills to wrangle data and build tools for data analysis. A Data Analyst collects, processes, and creates visualizations in order to gain insights from complex data sets. Ensure portfolios are risk balanced, help find new trading opportunities, and evaluate asset prices using mathematical models. In every DataCamp exercise, you are writing and running real R, Python, or SQL code. You won’t just learn the theory, you’ll get hands-on experience exploring real data sets in courses covering the entire data science workflow. DataCamp courses are taught by the best instructors in the world. 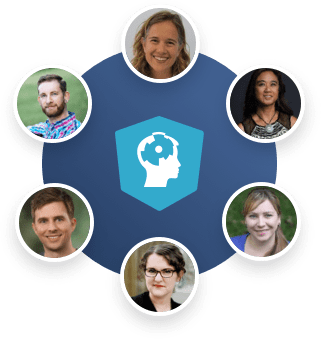 Our instructors come from academia and industry, are package creators and project maintainers, and have developed some of the most widely used data science tools in the world. With DataCamp, you’ll be learning from the experts. Everyone knows practice is key. With case studies built into every course, you’ll get to apply your new skills right away. Plus, in practice mode, you’ll be able to keep your skills razor sharp with fun daily challenges. I've used other sites—Coursera, Udacity, things like that—but DataCamp's been the one that I've stuck with. Devon was able to transition to an analytics role at her bank, and is using DataCamp to hone her skills. Thanks to DataCamp, I can now look at business problems and evaluate if we can solve them with the help of data science. Markus is a consultant who uses his new skills to build models to help his business succeed. DataCamp is a lot better than other online learning platforms I've tried. It takes less time, it is more efficient, and you get hands-on practice. Harshvardhan is studying financial economics at the Gokhale Institute of Politics and Economics in India. On DataCamp, you learn from the experts. As you are taking courses, you are really learning from the best instructors in the world. Ofentswe is a data scientist in South Africa interested in advanced machine learning techniques. Cajamar Cooperative Group uses DataCamp to improve and homogenize R competencies within their group. What's the difference between a career track and a skill track? Our career tracks cover everything you need to kickstart your career, from our intro courses to our most advanced offerings. Our skill tracks are shorter and let you specialize in a specific area, like data visualization or statistics. Once I've started, can I change tracks? Of course! If you decide to rejoin a track, any new course progress will be applied automatically. Will I earn a certificate for completing a track? Yes. In addition to earning certificates for each course you complete, you will earn a special certificate upon completing a track.